He’s got good teeth. He’ll do. Third! Is his shirt wrinkled? He’s smiling because he stole your iPony. We know he’ll be a good fit, because his Adam’s apple is as big as his nose. Tim Cook is John Gruber! But MW, if Tim Cook is John Gruber and Moltz is Gruber, then Tim Cook is John Moltz! Del — Fire up the critter factory. I think we have a special end-of-times condition. Cook… blue shirt, no Pants™? My Pants™ are vetting his pants. We’ll keep you advised. About the teeth… yeah… but at least his hair is nice. Hmm. I like Tim, but he’s not very ethnically diverse. I’d like to see something in a cross between Jackie Chan and Old Spice Guy. With a laser mounted on his head. NBot sure about the ears. Whoever did them was using pinking shears. No one has said the word “First!” yet, so that makes me first on a technicality. His hair looks like a shiny gray helmet. Is he a knight or a pawn? One collar up, the other down. Is he waffling already? I was in a band with a guitarist called Tim Cook. I have nothing more to add. Move along. I was in a band with an exotic dancer, bit like the bloke in Boney M, called BroMu. Correct phrase as taught at Hendon is, “Move along there.” or “There’s nothing to see so move along there.” if you have enough breath left. Bahahahah I forgot there was a main post!!! I think he will do marvelously once we graft on a few more arms. They need to pay him more so he can afford a necktie. I have to add that his name is particularly outstanding for “Talk Like a Pirate Day.” I mean, Cap’n Cook says it all. How come nobody has created one of those creepy photo-illustrations of Tim Cook like they did with Gruber? 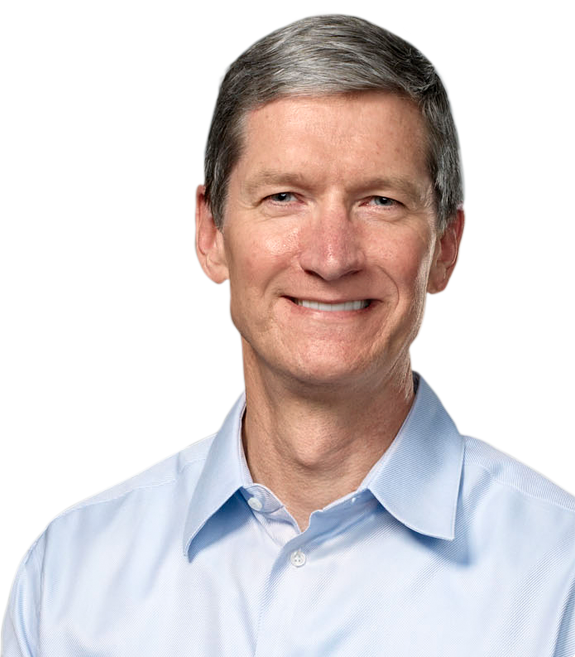 That picture is of Tim Cook wearing his other shirt. What is it about Tim Cook and three dozen that requires us to stop? We’re waiting to take another look at Tim, but that would require a new post from Moltz. It is TLAPD, so Aaaaarrrrrrrh!. Methinks it be “y’argh,” but why quibble? Let’s hoist a flagon of ale instead. He looks like a football coach from the SEC. Rest in peace, Steve. Thanks for everything. Thanks for an insanely great ride, SJ. The Mackintosh changed computing, thanks Steve. Sad he’s gone, but glad for what he made, and made possible. Goodbye Apple! Looks like another Sculley. Not a “product” man like Jobs. Just another process man.